Caroline Funk | March 28, 2018. Human embryologists’ best-kept secret could arguably be the Carnegie Stages of Human Embryonic Development. 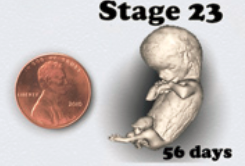 This system was established in 1942 and classifies the first eight weeks of every human being’s life into 23 stages based on objective developmental mile markers, beginning at the first contact of egg and sperm and continuing on into the fetal period. When U.S. Supreme Court Justice Harry Blackmun famously wrote in the Roe v. Wade decision, which legalized abortion in the United States, that, “We need not resolve the difficult question of when life begins,” he was correct in a very real sense. The Supreme Court did not need to resolve this question because scientists had answered it over three decades prior – human life begins at the first moment of fertilization, Carnegie Stage 1a. At great cost, Justice Blackmun’s decision was not informed by an accurate view of the science of human embryology – a problem also found in current policy and education. This knowledge gap is what a Washington, D.C. area science education non-profit is out to fill. Contend Projects is a secular, non-partisan organization that exists to make the accurate facts about when human life begins known by all. They are working to make the basic science documented in the Carnegie Stages easily accessible, clearly and simply explained, and as well-known as the periodic table of elements. The scientific field of human embryology holds that a new, whole, distinct human being comes into existence at fertilization (Carnegie Stage 1a). Scientists have observed the self-directed development of the human embryo beginning at this first moment and proceeding on through the eight weeks of the embryonic period and beyond. This process of development was first documented as the 23 Carnegie Stages by a branch of the National Institutes of Health (NIH) over 75 years ago. Since then, the Carnegie Stages have been annually studied and verified by human embryology’s global committee of experts, the Federative International Programme for Anatomical Terminology (FIPAT). Embryologists have had the privilege of viewing embryonic development, this “wonder of the world” hidden in mothers’ bodies, for decades. Now, Contend Projects is working to bring this marvel of science to all. Their website contains an interactive map of the Carnegie Chart, where website visitors can view photos of young human life at each stage. The site also hosts a compilation of major scientific sources in the field of Human Embryology and highlights important research such as The Virtual Human Embryo, a multimillion dollar, 11-year initiative led by prominent embryologist Dr. Raymond F. Gasser. Dr. Gasser and his team created animations, 3-D reconstructions, and videos of each stage of human embryonic development, giving an unprecedented view inside the womb. In one feature of The Virtual Human Embryo, site viewers may even watch short movies of embryonic human life – like this one of a 4 ½ week old embryo’s beating heart. Contend Projects makes the point that the Carnegie Stages are a required aspect of every human embryology textbook internationally but are left out of most other science curriculums. For example, the Next Generation Science Standards, a K-12 science curriculum adopted by 17 states and D.C., do not contain the Carnegie Stages nor any science about when human life begins. To remedy this, Contend Projects has created resources for educators to integrate the basic facts of human embryology into their science instruction in a creative, interactive, and accurate way. They also have colorful Carnegie Charts ready for any classroom upon request. In addition to being absent from Supreme Court decisions and science curricula, Contend Projects points out that there are Federal regulations in the United States which are also missing the accurate science of human embryology. Title 45 of the Code of Federal Regulations Part 46 does not define pregnancy at fertilization, when science demonstrates a new human life exists. Rather, the regulation reads: “Pregnancy encompasses the period of time from implantation until delivery.” (emphasis added) This allows the Food and Drug Administration (FDA) to label drugs as “contraception” if they work to prevent pregnancy – and since pregnancy is defined as beginning at implantation, and not at fertilization, these “contraceptive” drugs can actually end the life of a new human embryo. In other words, since fertilization (Carnegie Stage 1a) occurs in the mother’s fallopian tube, the embryo must then travel to the mother’s uterus to implant (Carnegie Stage 4). FDA-approved “contraceptive” drugs such as Ella, Plan B, Copper Intrauterine Devices (IUDs), and some forms of hormonal birth control, can prevent the embryo from being able to implant in the wall of the uterus and thus end his or her life. Contend Projects seeks to educate people on the scientific realities related to critical health decisions such as this and empower them to make informed decisions based on accurate science. The internationally accepted Carnegie Stages of Human Embryonic Development offer the world accurate information on how you and I developed during our first eight weeks of life, from a single-cell zygote to an eight-week-old fetus. Contend Project’s work to bring these facts, this “window into the womb,” to all of society is good news for anyone who believes in the power and necessity of quality scientific evidence. Caroline Savoie is a former research associate and current guest contributor for the Charlotte Lozier Institute.